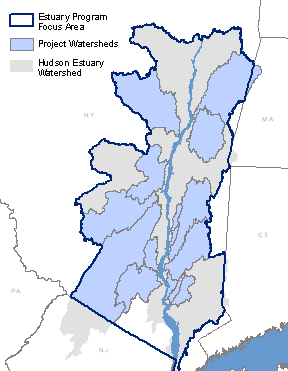 The Hudson Estuary Watershed Resiliency Project is a combination of research, demonstration, and educational outreach projects to address the challenges of flooding, stream and watershed management, and climate change. 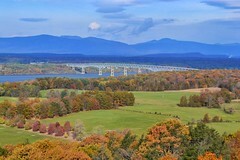 As part of this project, Cornell University and Cornell Cooperative Extension (CCE), in partnership with the NYS Water Resources Institute at Cornell University and with support from the NYS Department of Environmental Conservation’s Hudson River Estuary Program, are conducting an educational initiative with a focus on flood resiliency and climate change. This effort provides communities with tools to enhance their understanding of stream dynamics, floodplain function and watershed planning to reduce their vulnerability to floods in an era of increasing heavy precipitation events. The project evaluates the capacity of communities to respond to floods in a manner that reduces future flooding impacts and ensures the long-term viability of stream systems. Outreach efforts include presentations and trainings for municipalities, resources to assist in planning to reduce vulnerability to flooding, education for streamside landowners, and fact sheets regarding jurisdiction in streams and what agencies to contact during and after flood events. This project includes a collaboration with the Lower Hudson Coalition of Conservation Districts to deliver Post Flood Stream Intervention trainings to highway personnel and contractors. Since 1970 New York State has seen an increase in both average summer and average winter temperatures (a 2ºF increase in summer and a 4ºF increase in winter). Along with increased temperatures we have seen an increase in the number of extremely hot days in a year and a decrease in the number of cold winter days. Thes e temperature changes have led to impacts on our water cycle including fewer days of snow cover and heavier rainfall events. 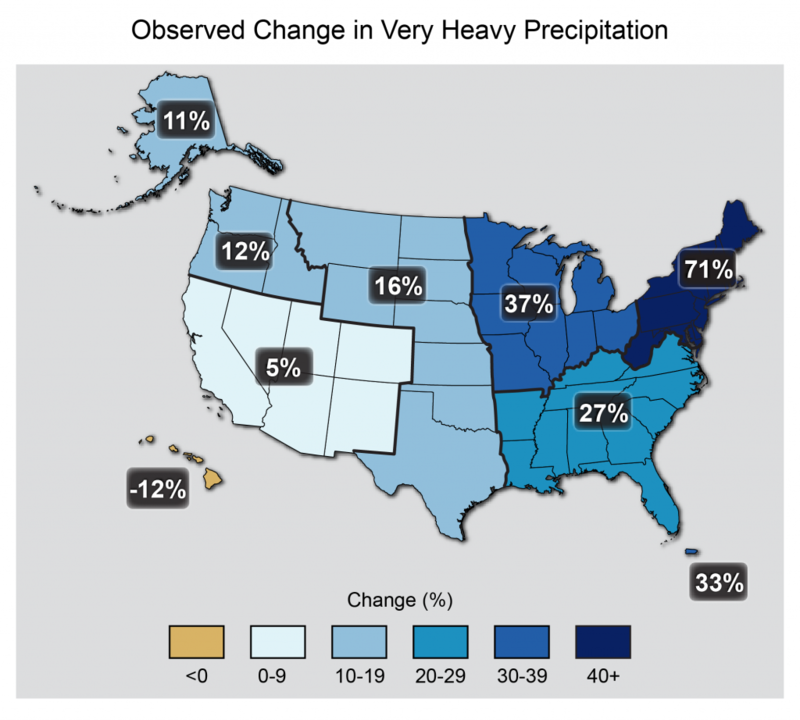 Precipitation has increased over the entire United States since 1900. Since the 1950’s New York has seen a 67% increase in the number of 2-inch rainfall events occurring over a 48-hour period. Across most of the U. S. the heaviest rainfall events have become heavier and more frequent and this trend is projected to continue. Since 1980, there has also been an increase in the overall strength of hurricanes and the number of strong hurricanes in the U.S. This trend toward more intense hurricanes is expected to increase as the world’s oceans continue to warm. These extreme precipitation events increase the risk of localized flash flood events that impact human health and safety, and result in substantial damage and costs to property and infrastructure. Hurricanes Irene and Lee and Superstorm Sandy are recent examples that forced thousands to evacuate their homes, caused billions of dollars of damage and led to the loss of human life. Communities need to recognize the risks associated with these extreme precipitation events in order to reduce their vulnerability to potential damage. Floodplains are the flat areas of land that surround streams on either side of its streambanks. These areas allow water that has spilled out of the stream channel during flood events to spread out and slow down so that water seeps back into the ground. 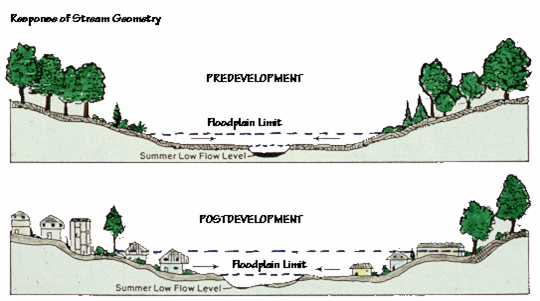 Floodplains are naturally supposed to flood. By allowing waters to slow down and spread out, floodplains help control the erosive force of water and prevent flooding further downstream. In addition to changes in precipitation, changes in land use associated with development affect flooding in many ways. Impervious surfaces, like parking lots, buildings and roadways, prevent precipitation from soaking into the soil. This can increase the amount of water that flows over the land surface, heading downhill to the nearest ditch or stream. This, in turn, can cause streams to rise more quickly and lead to an overall increase in the volume of water within a stream during a storm event. Streams are living systems and they react to these types of changes in their flow patterns. Due to the nature of our roadways and residential development, most streams are confined and constricted by human infrastructure. Streams are often diverted and forced to move through culvert pipes, beneath bridges and next to roads. Buildings and other structures are built in the floodplains causing flood waters to rise and reach new heights. When this occurs, structures that were once located outside of the floodplain can become susceptible to flooding. Man-made obstructions prevent a stream from using its’ floodplain causing the stream to have greater erosive force and be more prone to flooding. Streams that have been straightened, deepened or constricted will become unstable and more prone to erosion. An understanding of stream and floodplain dynamics along with proactive management and planning can provide communities the opportunity to mitigate and minimize flooding risks while conserving limited financial resources. The Hudson Estuary Watershed Resiliency Project is designed to help communities address the complex issues of flooding. In the coming months, CCE will be designing presentations and workshops on a variety of topics for multiple audiences. This second year of the project will see a new seminar series, conferences, and presentations for municipal officials on stream basics. Outreach will also be delivered to streamside landowners within the watershed. For more information, please contact Carolyn Klocker at cak97@cornell.edu or (845) 677-8223 x130.